Nim and Lil were sitting around two tiny steaming mugs of hot chocolate, a large marshmallow bobbing up and down in each cup. “Did you hear Joe’s squeal of delight when he found me stuffed in a jar full of marshmallows?” Nim asked Lil. Lil nodded her head and took a sip of the delicious drink. Their trip back to the North Pole had been quick and uneventful. They both had told Santa how well the four kids had been behaving. They were taking turns, helping each other and playing together with little to no tears, tiffs or tantrums. “We should do something nice for the kids tonight,” Lil said. Nim agreed and they both tried to think of something they could do to reward all the good behavior. “I think I’m too hungry to think of something. I need something sweet to eat,” Nim said as he wandered to the box of mini powdered sugar donuts that rested on top of the flour canister. Lil watched him struggle with opening the box. After a huge tug, the lid to the canister popped off and Nim tumbled to the counter in a puff of flour and powdered sugar. Lil giggled as Nim stood up and shook flour from his hat, giving her a silly grin. “That’s it Nim!” exclaimed Lil. She zoomed to the spice cabinet and flew the cinnamon to the counter. “What’reyadoinLil?” Nim asked with his mouth full of donut. 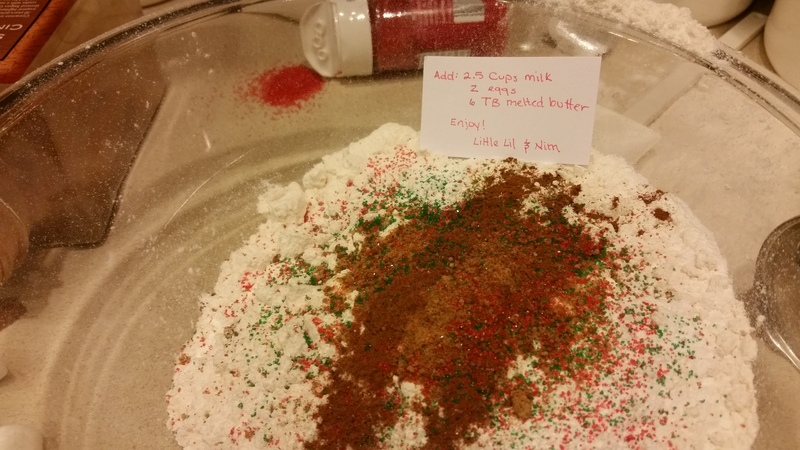 After pouring three cups of flour, 3 tablespoons of baking powder, a bit of sugar, a dash of cinnamon, a pinch of salt and enough red and green sprinkles to cover a dozen cookies into a big bowl, Nim and Lil fell in a jumbled heap on the counter. “After all that work I am really hungry now!” Nim groaned. 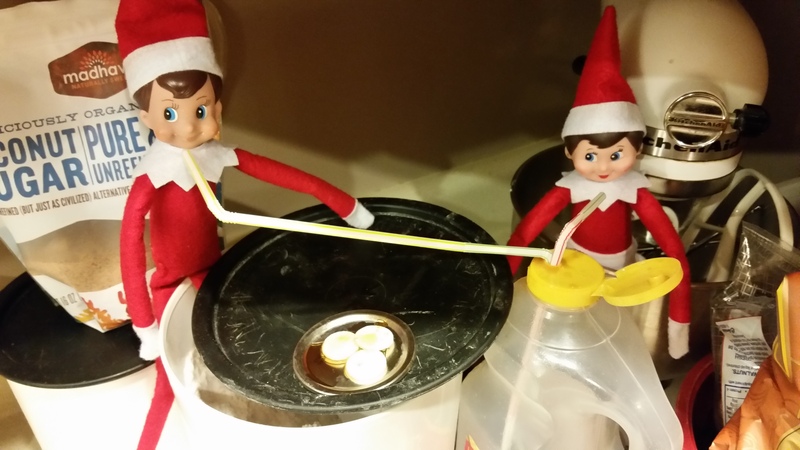 They cooked a few pancakes for themselves, added more sugar and sprinkles and cooked some more until they were finally satisfied with the mix. Lil jotted a little note with instructions for finishing up the batter and flew over to where Nim sat pushing straws together. “I made one for you too,” said Nim, pointing to the straw sticking out of the bottle of delicious maple syrup. Nim smirked as Lil slurped happily on the syrup. The kids were going to be so excited in the morning.